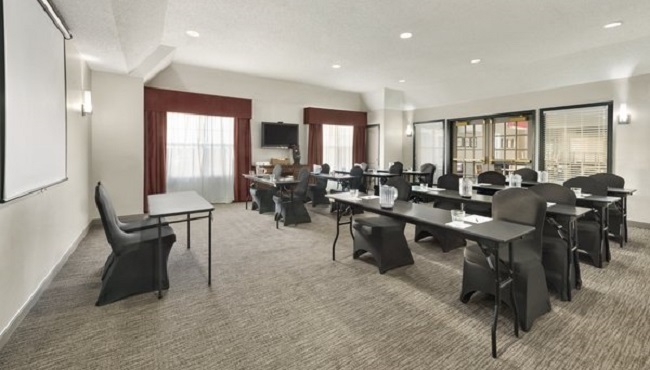 Host your next business seminar or birthday bash for up to 40 guests in the versatile meeting room at the Country Inn & Suites, Kansas City at Village West, KS. Our friendly, dedicated staff can assist you in arranging the room, and we are happy to provide complimentary beverage service at your request. We also serve breakfast or snacks for a nominal fee. To make the most of your presentation, take advantage of free high-speed Internet, a pull-down projector screen and a 42-inch flat-screen TV with a DVD player. Ask about group rates for overnight event attendees.